There's no question that the recent Senate hearing on CME was stacked against industry funding of CME, but that's because from the standpoint of the American public and Congress, the practice is slimy and wrong. Senator Mel Martinez, a republican from Florida, summed up the mood best with his perplexed question (I'm paraphrasing here): "Wouldn't it just be better if doctors paid for their own continuing medical education?" As a lawyer, he said, he always paid for his own CLE (continuing legal education) and he was never paid to give CLE lectures. To those of us who have lived and breathed this issue for years, his question came across as innocent, but in fact it hit the obvious point, and surely summarized the view of most Americans. Tom Stossel, to his credit, came out swinging in a ring where he was badly outnumbered, but as he often does, he conflated two issues: the remarkable advances in medicine over the past few decades and industry funding of CME. The two are not related. We've had advances in medicine because of great science and appropriate interactions between doctors and industry--bona fide relationships based on developing products and conducting clinical trials. None of these relationships would be threatened in any way by the Physician Payments Sunshine Act or by the IOM's proposal to greatly scale back industry funding of CME. My favorite moment of the hearing was when Senator Al Franken directly confronted Stossel, saying (again, I'm paraphrasing): "You seem to draw a lot of conclusions from anecdotes of people who have benefited from modern medicine. Medicine is a lot better now than when we were kids, but that doesn't mean that industry should fund CME." Dr. Kopelow's comments were disappointing in the extreme. He repeated a single refrain, saying, in essence: "There is no problem with bias in CME. We are doing our job well. ACCME is the firewall between promotion and education." C'mon Murray! You know what's going on. You've seen the many, many letters of complaint reporting biased programs. In fact, you reprimanded one company for bias within the last few months--I know, because the reprimand was based on my letter. It only took you about two years to issue your decision. I won't mention the specifics in this blog because I promised you I wouldn't. I liked Lew Morris's comments. He's the General Counsel, U.S. Department of Health and Human Services, Office of the Inspector General, and so he's pretty influential. He wants to set up "independent CME grant organizations" that would pool industry funds and divvy them out in ways that don't promote specific treatments or lucrative disease categories. Good luck to him. He admits that drug companies have shown zero interest in parking any of their so-called "unrestricted educational grants" in such organizations. He alluded to one that was set up by a surgical association. Its current budget: $0.00. Clearly, companies will only fund CME if they see a promotional advantage. The Senate Aging Committee website has now posted links to all the written testimony, including my testimony (I am erroneously identified as being from the Cleveland Clinic--apparently they mixed me up with Steve Nissen and I am flattered! ), as well as testimony from Pharmed Out (Dr. Adrian Fugh-Berman), and from a series of organizations that have vested interests in keeping things as they are, including the University of Wisconsin, PhRMA, AdvaMed, and Merck. Industry-supported CME received a merciless drubbing today at the Senate Hearing. I'll report some of my observations tomorrow, but for now I wanted to post some of the written testimony, since it may not be available from the Senate for another week or so. I'll post others as I receive them. 2 pm: Let the games begin! 2:15-- Senator Al Franken: Proud that his state of Minnesota was the first to pass a disclosure law in 1993. However, transparency is not enough, because between 2002-2004 many millions were paid to physicians for marketing activities. 2:25-- Lew Morris, General Counsel, U.S. Department of Health and Human Services, Office of the Inspector General: We need more effective safeguards. The current environment allows drug companies to choose topics related to their products. We suggest independent CME grant organizations. They would serve as firewalls between donors and the education. It's not clear that companies will go along with this. CME has become an insidious vehicle for the promotion of medical products. This is undermining the independence of medical societies. Current ACCME oversight is ineffective. Few if any communication companies have lost their accreditation for biased CME. He has written letters of complaint about some activities to ACCME but he received no response. The members of the Institute of Medicine Committee generally agreed that CME has become far too reliant on industry funding. The current system of funding is unacceptable. More transparency is necessary. AMSA has been a leader in the movement to clean up conflicts of interest. Students are able to be passionate advocates for patient care, since they are not already tangled up in payments from industry. He talked about the Harvard Medical student's rally to improve its COI policy. Harvard had received an "F" on AMSA scorecard in past but due to recent changes now earns a "B". Medicine is much better now than when he started training. Death rates from cancer and heart disease are lower. We have a great system of innovation and education. There has been a lot of moral bullying, but not a lot of evidence. Do patients benefit from physician industry collaboration? Definitely. We do need to support continuing innovation in medicine. But patients need to be able to rely on the objectivity of their physicians. The APA has decided to phase out all industry-supported medical education symposia. We are the first medical society to do this. This will cost us a million and a half dollars this year. But we feel it is well worth the cost. ACCME is the firewall between promotion and education. 15% of providers receive 80% of commercial support. He recounted many proposals to limit promotional influence, but said that none of them have been implemented yet. We are improving our surveillance of CME activities. We are increasing our staff. It was only a matter of time before the U.S. Senate decided to shine a national spotlight on one of the more corrupt sectors of the nation's economy: industry-sponsored continuing medical education (CME). Senator Herb Kohl (D-Wis) has just issued this press release announcing a hearing entitled "Medical Research and Education: Higher Learning or Higher Earning?" It will take place Wednesday, July 29, at 2 p.m., at 562 Dirksen Senate Office Building in Washington DC. You can view it live on the web by going to the Special Committee on Aging's website. To view the all-star line up of those providing testimony, see the press release link above. I think it is safe to say that there will be some very strong testimony about the plethora of sham "educational" programs that are in reality marketing exercises for the drug companies. While I will not be there in person, I was invited to provide written testimony, which I will post after the hearing itself. I encourage all of you to take some time out of your schedules tomorrow to watch the webcast (hey, it's summer--just cut out of work early). I anticipate that this will be a historic event in the world of medical education. Yesterday, I attended the charter meeting of ACRE (Association of Clinical Researchers and Educators) in Boston. The title of the conference was “Optimizing Value to Patient Care of Industry-Physician Collaboration,” and the schedule called for 23 speakers over a 6 hour period, all in a hot amphitheater crowded with pharmaceutical reps, doctors, reporters, and miscellaneous others. Obviously, I arrived with a skeptic’s attitude. After all, I had already parodied the organization with this mock blog renaming ACRE “Academics Craving Reimbursement for Everything.” I was not alone in my difficulty taking the organization seriously. On the pharma gossip website, there was an even more vicious parody, in which the organization is renamed Forum for University Corporate Kickbacks in Education as Determined by University Professors, yielding a more colorful acronym which you can work out on your own. Why is ACRE so very ripe for satire? Because it consists of rich doctors complaining that they want more money from drug companies, and such an organization lacks any inherent credibility, and seems, frankly, absurd. On the other hand, I like and respect the “two Toms” (Tom Stossel and Tom Sullivan) who formed the organization and I realize that there are some purer motives than greed operating here. That’s why I attended the meeting. The whole experience felt very much like an anthropological expedition. I took Boston’s Green Line to Harvard’s Brigham and Women’s Hospital (where Dr. Stossel is an esteemed faculty member), a building so massive that the main hallway is called the “Pike.” I was directed by the information clerk to walk down the Pike and take “exit 6” to reach the Bornstein Amphitheater. I arrived 10 minutes late and encountered a small auditorium with steep rows of seats so crowded with pharmaceutical executives and physicians that people were sitting on the steps. I squeezed into a seat in the middle of a row that had been overlooked by the masses, and began my experience of the cultural village that is ACRE. For the most part, what unreeled over the next 6 hours was an endless succession of smart, accomplished, and furious men (actually, there were three women—two of whom were patients). Harvard’s dean, Jeffrey Flier, introduced the conference, but his comments must have been exceedingly short, because by 10:10 AM, Dr. Stossel was speaking. As I said, I’ve always liked Tom Stossel, even though we disagree about the value of industry’s use of physicians as marketers and educators. He’s always entertaining and creative. He’s the guy who hatched the evocative term “pharmascolds” to describe people like Senator Grassley and me and plenty others, and in this talk he called the current regulatory environment a “conflict of interest police state.” Though some paint Stossel as an extremist, he is not, and in fact made clear at the outset that the goal of ACRE is not to repeal the recent gift ban and disclosure law passed by the Massachusetts legislature. Rather, he wants ACRE to act as a forum for preventing further restrictions on industry-academic interactions which he feels would be detrimental to medical research and treatment. His heart is in the right place. Unfortunately, after Stossel’s introductory remarks, the program devolved into a collective middle finger pointed at everybody viewed as the “enemy,” which included government, elite academics (yes, even though the conference was held at Harvard), bloggers, The New York Times, all medical journals, most lawyers, and then I began to lose count. It may seem comical, but something more serious than word-play was happening here. The defining problem with inappropriate industry influence in medicine, is, indeed conflicts of interest. When doctors are paid by drug companies to give talks, they are accepting two conflicting and competing incentives: first, deliver the carefully crafted marketing message provided by the drug company, or second, tell the entire truth, which may well include bad things about the drug. Except in rare cases, this ends up not being a convergence, an overlap, or a confluence—it is a conflict. Dr. Michael Weber, a New York cardiologist with an Australian accent, described his industry ties by saying “I’m proud to say that my list of disclosures is longer than anyone else’s.” Everybody laughed. This was funny. This was clever. Subverting the “politically correct” value system of pharmascolds was a crowd-pleaser in ACRE Village. But the eeriest presentation came from one J. Michael Gonzalez-Campoy, an endocrinologist who was flown out on the ACRE-jet from Minnesota. His job was to convince everybody that Minnesota’s 1993 physician payment disclosure law (the first in the nation) was an awful mistake. His tactic, theoretically, was a good one. “The law has been terrible for patients,” he declared, speaking in the ominous tones of a doctor notifying you of grim laboratory results. “Oh boy,” I thought, pen poised, “finally, some data on the effects of transparency laws on patient outcomes.” But alas, Dr. Gonzalez-Campoy’s evidence base amounted to a single patient, a 73 year old man with severe diabetes. “Do you know what drug he was on?” He asked incredulously. “The cheapest drug money will buy—Glyburide….When I asked my patient why he was on that drug, I was appalled by his answer. He told me that his PCP said it is the most cost-effective drug.” It got worse: the patient had apparently been reading newspaper articles saying bad things about the newer diabetes drugs, like Avandia. The kicker was when he told Dr. Gonzalez-Campoy that “I’ve read that doctors are getting brain-washed by drug companies to prescribe these drugs.” Don’t you see what the Minnesota disclosure law has wrought? Patients getting prescribed generic medications. Patients reading the newspaper. Patients questioning the morals of their physicians. Tom Sullivan, who put together the event, sounded entertainingly like one of his blog postings—outraged, sarcastic, but with enough actual policy information to keep my attention. Boy, is Sullivan ever pissed at Senator Herb Kohl , who has just announced a senate hearing on industry funding of CME to be held next Wednesday. “Senator Kohl woke up one day last week,” he riffed, “and decided that his staff hadn’t done anything for a while, so he told them to get a hearing together.” I can see why Sullivan is threatened—industry-funded CME is his company Rockpointe’s bread and butter. There are various awards to be given. Dr. Carey Kimmelstiel, an interventional cardiologist and a professor at my own medical school, Tufts, gets the award for whiny entitlement. His talk was about the value of industry-supported promotional talks. Among the benefits: You learn a lot when you give them, you can network with your colleagues, and your colleagues learn a lot from you. That’s true, but has nothing to do with industry support. It’s possible to give the same talks to colleagues and reap the same benefits without getting a drug company check. It’s actually part of the job of being a medical school professor. But this was merely the irrelevant portion of his talk. The whiny entitled part came when he showed us an email from Doug Drachman, a Mass General cardiologist who has been organizing quarterly meetings of Boston interventional cardiologists to talk about interesting cases. His email broke the bad news that because of the Massachusetts law banning industry from taking doctors out to fancy dinners, these meetings are being postponed. Dr. Kimmelstiel was outraged. Look at the unintended consequences of the gift ban law—now cardiologists can no longer meet with another. That’s rich. Interventional cardiologists are some of the highest salaried professionals in the world, and yet they refuse to pay for their own dinners four times a year? That’s why I call the organization Academics Craving Reimbursement for Everything. Oddly, the best and most convincing presentation was also the shortest. Dr. Jeffrey Garber, chief of endocrinology at Harvard Vanguard, profiled the American Association of Clinical Endocrinologists, of which he is the president. He outlined all the good things the organization is doing to educate primary care doctors and the public about diabetes and thyroid disease, all of it funded by industry. His point was that without industry money his organization couldn’t do all these great things. Probably true, though there are other ways for doctors to learn this information, like grand rounds, journals, and meetings that they might have to pay for themselves. Henry Black, the President of the American Society of Hypertension, basically made the same case as Garber, arguing that his entire organization would cease to exist without drug company money. Unfortunately, Dr. Black got the day’s award for the most mangled slide. In a tirade against a recent JAMA paper recommending that medical societies cease industry ties, he started insulting the individual authors, saying, essentially, that most of them are washed up has-beens. Unfortunately, he had Dr. James Scully listed as the “president of the Josiah Macy Foundation,” rather than his actual job, which is the executive director of the APA. I didn’t point it out, because he was just working up steam and was beginning to froth at the mouth. It was the quintessential ACRE moment: fury, self-righteousness, and getting everything a little bit wrong. In all the hoopla and excitement of forming a new organization such as ACRE, certain minor details are easy to overlook. One of these details is a listing of financial disclosures, which is conspicuously missing from the ACRE website. In the spirit of helpfulness and tying up loose ends, here is a partial list of industry disclosures that might otherwise get lost in the shuffle. Disclosure: Thomas P. Stossel, MD, has disclosed that he is on the Board of Directors for ZymeQuest, Inc. and Critical Biologics Corporation. Dr. Stossel has also disclosed that he owns stock options in ZymeQuest, Inc. and stock options and stock in Critical Biologics Corporation. Dr. Stossel has also disclosed that he has received a consulting fee from Critical Biologics Corporation and that he is a paid lecturer at corporations. Source: Dr. Stossel's response to the AMA's ethics council's recommendations to limit industry funding of medical education. Disclosure: Henry R. Black, MD, has disclosed that he has served as an advisor or consultant for Pfizer, Bristol-Myers Squibb, IntraCure, sanofi-aventis, Merck Sharp & Dohme, Forest Laboratories, Daiichi Sankyo, Boehringer Ingelheim, and CV Therapeutics. Disclosure: Previously received a $500,000 research grant from Bristol-Myers Squibb. He also consulted for three Cambridge biotechnology companies, but says that those relationships have ended and that he has accepted no new industry affiliations. Source: This New York Times article on conflicts of interest at Harvard Medical School. Disclosure: Consultant for Amgen Inc., Genzyme Corporation, Medtronic. Speaker's Bureau for Celgene Corporation, Millennium Pharmaceuticals, Inc. Source: The Center for Biomedical Continuing Education, a MECC specializing in industry-funded CME programs. Disclosure: Consultant to KingPharmaceuticals and Abbott Laboratories. Source: Abbott-funded CME supplement to the Journal of Family Practice. Disclosure: Consultant for Teva Pharmaceuticals; advisor and speaker's bureau for both Centocor and Genentech. Source: Website of PRIME, a MECC specializing in industry-funded medical education. Disclosure: Research funding from Alexion, Amgen, Anthera, Bristol-Myers Squibb, Eli Lilly, Johnson and Johnson, Genentech, MGI Pharma, Ortho Biotech. Source: CV of Avi Markowitz. Once a year, the ACCME (Accreditation Council of Continuing Medical Education) releases its Annual Report detailing the state of the health of the CME enterprise. It reports various things, like how many CME courses have been offered, how many physicians have taken part, etc.... But the meat of the report is always on page 8, Table 7: "Income and Expense by Organization Type". This year, the big news (though not that newsy to those who have been following the issue) is that for the first time since financial records were reported in 1998, the size of the CME industry has contracted. In 1998, the total income for all CME activities was $888 million, and over the years, it steadily increased to a high of $2,539 million in 2007. Well, last year, the total dipped to $2,365 million, a "loss" of $174 million. Why do I put the word loss in quotes? Because virtually this entire shortfall was accounted for by a decrease in commercial support for CME. Commercial support dropped from roughly $1.2 billion in 2007 to $1 billion in 2008. This is actually good news, because drug companies support CME in order to encourage doctors to prescribe the newest and most expensive drugs, even when these drugs have no advantages and, as often happens, have more severe side effects than older agents. But the news is even better than this. Drug companies are wisely electing to pull their money out of the most corrupt and biased of all CME-providing entities--the for-profit Medical Education and Communication Companies. As you can see in this chart put together by my assistant who painstakingly entered years worth of ACCME numbers into an Excel spreadsheet (note to ACCME--shouldn't this data crunching be your job? ), commercial support for MECCs has entered free fall mode. In 2007, drug companies forked over $594 million to MECCs in order to promote their newest and most expensive products; last year, they reduced the spigot to $463 million--a decrease of $131 million, or a 22% drop. And believe me folks, the 2009 report will look even worse for MECCs. Pfizer has announced that it will no longer fund them. The American Psychiatric Association is ending industry sponsored symposia, all of which are administered by MECCs. The AMA, in its latest CEJA report, said that commercial funding should be allowed only if the CME provider is deemed "not overly reliant on funding from industry sources." Translation: for-profit MECCs will no longer be kosher. (I realize this second CEJA report has been sent back to committee to tweak language such as "ethically permissible" but the language regarding MECCs will likely survive). 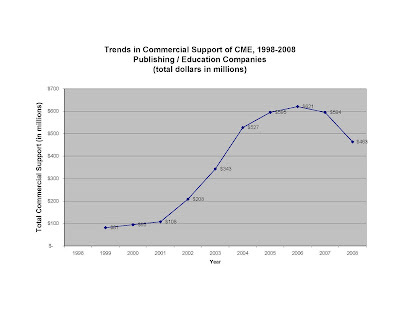 Finally, the Institute of Medicine has called for a drastic reduction in commercial support of CME. So goodbye MECCs. Your Christmas and Hannukah lasted a long time, but it's finally winding down. Everybody’s buzzing about the new organization and website, ACRE, whose purpose is to stem the tide of legislation that is rehabilitating the ethics of physicians. The trouble is, there is some confusion about which is the true ACRE website. Is it this one, which calls itself the "Association of Clinical Researchers and Educators"? Or is it this one, which calls itself "Academics Craving Reimbursement for Everything"? It's devilishly hard to distinguish the two, because their messages are identical. At any rate, either ACRE 1 or Acre 2 is hosting this fancy conference to convince everyone that doctors should be giving more, rather than fewer, promotional talks for drug companies. Incredibly enough, one of the scheduled speakers is Dr. Jeffrey Flier, the dean of Harvard Medical School. I guess we now know where Dr. Flier stands on the issue! In support of Dr. Doug Bremner, blogger supreme and Professor of Psychiatry and Radiology at Emory Medical School, I hereby proclaim my own academic affiliation--namely, Associate Clinical Professor of Psychiatry at Tufts University School of Medicine. Recently, Emory University forced Dr. Bremner to remove its name from his blog because they didn't like things that he had to say. This has resulted in two things: First, Dr. Bremner's blog quadrupled in popularity, and second, Emory is in the midst of yet another PR fiasco. See yesterday's article in Emory's online newsletter Academic Exchange for a good rundown of this issue. Here's my modest proposal. Between its poor handling of the Charles Nemeroff scandal and now its fumbling over Bremner, Emory should relinquish the use of its own name on any of its official academic material. Sarah Goodwin, who is unenviably employed as Emory's director of media relations, made the best argument for Emory giving up its name, although she was referring to Bremner in her comments. To satirically adapt her statement for the issue at hand, "Emory has been bungling high profile issues for some period of time," and “if you read Emory's pronouncements over a long period of time, you can see comments it makes that may be of concern." The university would still be allowed to function, to educate, and to bungle, but it simply would no longer be allowed to print the name "Emory" on its buildings or stationery. Perhaps, like Bremner's blog, the school will see a quadrupling of its enrollment. Current Psychiatry has been publishing a series of deceptive ads that appear to be patriotic calls for freedom of the press, but which in reality are stealth endorsements of industry-funded CME, paid for by drug companies and medical education companies. I've reproduced the ad to the left here, but you can read it in its full, large-fonted glory here. "IN THE UNITED STATES," the ad begins, "THE PRESS CANNOT BE CENSORED. THE INTERNET CANNOT BE CENSORED. POLITICAL ADVERTISING CANNOT BE CENSORED." Here's the kicker: "WHY ARE SOME MEMBERS OF CONGRESS AND ACADEMIA TRYING TO CENSOR MEDICAL COMMUNICATIONS?" Then there are a few paragraphs of gibberish stating that information is important for quality health care (that's true, that's why I went to medical school and keep up on the medical literature) and how "Congress and academia are seeking to restrict the content of CME" and how this somehow amounts to "restrictions on how much information consumers and doctors can know about current and new treatments...."
At the end, in small italicized print, we read: "This message is brought to you as a public service by the Coalition for Healthcare Communication." To find out who is the "public" benefiting from their "service", surf on over to their website. It is simply a repository of political ammunition for medical education companies who are on their last ditch stand defending their business model, which depends on getting drug companies, rather than our doctors, to pay for CME. I am hardly the first physician to be outraged by this stealth ad. Michael Herbert, a primary care doctor and blogger, posted this analysis of the ad that is so nicely written it became an "editor's pick" of OpenSalon magazine. "Unsurprisingly, this campaign underscores what is wrong with CME funding. You can’t tell where the money is coming from. This makes it difficult to interpret the message, or measure the bias. If Big Pharma and drug marketers can’t defend their CME practices without disguising them in cryptic constitutional arguments, it is hard to see them presenting CME in a way that would allow doctors to clearly evaluate bias. This is not an ad for freedom of speech. It is an ad for secrecy. And secrecy in a scientific discipline is not a good thing." Dr. Herbert saw this ad in American Family Physician, and I assume the thing has metastasized throughout the medical literature. I urge readers to write letters to their professional journals in protest of this sneaky screed. I know I will. Yesterday, Psychiatric Times published this response to the Allen Frances critique of DSM-V. It is written by William Carpenter, who is Professor of Psychiatry at the University of Maryland, and the chairman of the DSM-V work group on psychosis. Carpenter begins his response by saying that Allen Frances is an "old friend," although from the tenor of this article, "old" may be the operative word. I know Dr. Carpenter myself, having interviewed him for the March 2007 issue of The Carlat Psychiatry Report, and having chatted with him here and there at APA meetings. He's a southern gentleman, and I found him very forthcoming and honest about a range of issues, including his refreshing skepticism of the value of some of the newer atypical antipsychotics. He has done some consultation with drug companies but very little over the past few years. He's definitely no hired gun, and he speaks his own mind. "In actuality, there will be very few substantive changes in the DSM-V. Most of the diagnostic criteria will be the same. We might add a handful of rating scales. There will be no 'paradigm shift.' We are considering adding a sub-threshold psychosis diagnosis but then again we may not--it's a complex scientific issue and we, like you, are concerned about overdiagnosis and stigma." Basically, Dr. Carpenter is saying that Dr. Frances has created a sensationalized straw man argument, making all kinds of predictions about DSM-V, few of which will materialize. Of course, Carpenter is focusing on only one of many diagnostic categories, so the Frances critiques may still apply to the rest of DSM-V. Hopefully, we'll hear from the other Work Group chairs soon. Prescription data-mining is a marketing tool in which drug companies purchase information from pharmacies that allow them to spy on doctors' prescribing practices. The companies use this information in a variety of sneaky ways. Front line drug reps download this information to their laptops and use it to tailor their marketing pitches before they call on doctors. Higher level marketing executives use the data to craft targeted marketing campaigns involving everything from pseudo-journals to invitations to promotional dinner meetings. It is a deceptive and quite nauseating marketing practice, but it has continued through the years because it seemed for a while that everybody stood to win. Drug companies got invaluable demographic information in order to sell the newest and most expensive drugs. Data-mining firms; like IMS, built thier entire lucrative business model on their new identities as information brokers; pharmacies reaped profits by selling prescription info to IMS and their ilk; the American Medical Association profits to the tune of several million per year by whoring out the organization and selling doctors' DEA numbers to data base firms; and finally, individual doctors in their offices started receiving dozens of invitations to fancy dinners by reps who wanted them to prescribe more of their drug. I've lost count--I think we're up to a "win-win-win-win-win" situation. But now this corrupt house of cards is tumbling down. Not all at once, but gradually, state by state, appeals court by appeals court. Here are a couple of recent developments. 1. New Hampshire. In 2006, New Hampshire's legislature banned data-mining. In 2007, lawyers were able to convince a district court to strike down the New Hampshire law by arguing that buying and selling prescription information was protected by free speech safeguards. In 2008, the First Circuit Court of Appeals overturned the district court's decision, and unanimously upheld New Hampshire’s Prescription Confidentiality Act. The forces of greed do not give up easily, and the data-firm lawyers submitted their case to the United States Supreme Court. Well, a few days ago, the Supreme Court declined to consider the case, sending a message to many other states that the ban on data-mining is, in fact, constitutional. 2. Vermont. In 2008, the Vermont legislature passed a law banning prescription data-mining unless physicians specifically opt in to their data being bought and sold. Data firm lawyers descended on the Green Mountain State, and submitted an appeal to the federal Second Circuit Court of Appeals requesting that they grant an injunction blocking the implementation of Vermont's law. Twas not to be. The Appeals courts just refused to block the law. Other data-mining provisions in other states are being contested by other attorneys, so we will continue to hear more about this issue. But the news is not good for IMS. I hope somebody there is writing out a new business plan.